The State of Michigan may have occupied Detroit, but that didn’t stop Detroiters from taking back the city’s downtown financial district on May Day. After a rally at Hart plaza on May 1, a predominantly older crowd of demonstrators shut down traffic on Jefferson Ave. They were protesting Emergency Manager Kevyn Orr and his efforts to reach a bankruptcy settlement that would drastically slash former ex-city workers pensions. Critics of the deal believe Orr’s plan would favor big banks over former city employees, and throughout the event demonstrators repeatedly chanted for pensioners to vote against the state’s preferred bankruptcy agreement. Police attempted to break up the gathering with squad cars when protesters moved from Hart Plaza to the street, but blockaders held their ground for about ten minutes before embarking on a march up Woodward. The procession then tramped raucously through the front of the Chase Bank, held an impromptu rally at the city federal courthouse and briefly occupied the lobby of the Westin Book Cadillac Detroit, the hotel where EM Kevyn Orr lives. 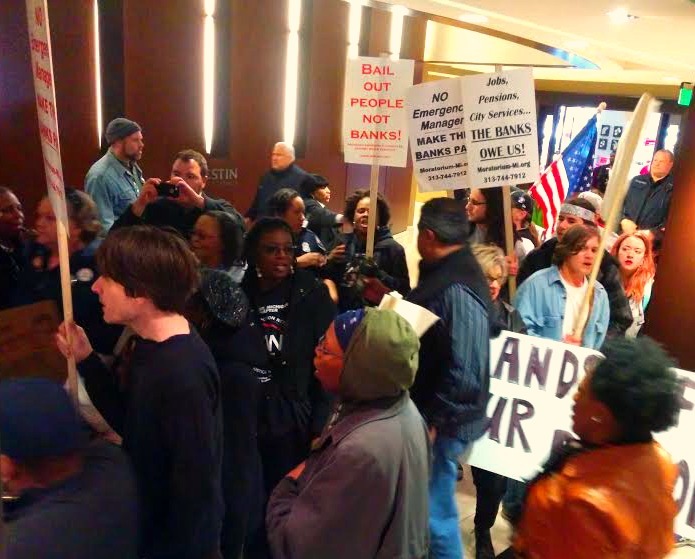 Although there were no arrests, the demonstration got rowdy at the Westin. At one point, the hotel manager attempted to wrestle a loudspeaker from one of the marchers. Around a dozen SWAT police swarmed into the building when this occurred, prompting marchers to exit the building and wrap up the event with a rally near the Hazen Pingree statue at Grand Circus Park. Barbara Carter, Vicci Hamlin, Lisa Leggio had their first breath of fresh air in weeks after being released from Ingham County Jail on March 5. The three women, known as the MI CATS 3, had been imprisoned there for 34 days after being convicted of chaining themselves to equipment at the Enbridge Pipeline construction in Stockbridge site to protest the company’s role in a 840,000-gallon oil spill into the Kalamazoo river in 2010. Judge William Collette sentenced them to time served and more than $47,000 each in court costs and fines. Later that month, nearly 1,700 gallons of oil leaked into Lake Michigan due to a distillery malfunction at a BP refinery in Whiting, Indiana. In late April, Michigan Attorney General Bill Schuette and Department of Environmental Quality Director Dan Wyant asked Enbridge to furnish them with documents outlining a contingency plan should two 61-year old pipelines located in the Straits of Mackinac burst. Recently there’s been some progress in the nasty labor dispute over at the Cesar Chavez Academy (CCA), a multi-campus charter school system based in Southwest Detroit. The two parties reached a settlement over a number of grievances back in March. The CCA Alliance of Charter Teachers & Staff, which formed after a vote last February, had accused the charter’s for-profit operator, the Leona Group, of more than two dozen labor violations. These included changing their health care plan without notification, cutting hours and dismissing Lynne Santascoy, a social worker who had been active in the campaign to launch the union. Efforts to resolve these issues were complicated by repeated cancellations of scheduled CCA Board meetings. CCAACTS filed multiple charges over their grievances with the National Labor Relations Board (NLRB) in January. On March 31, the birthday of famed labor leader Cesar Chavez, Leona and the union reached an agreement to reinstate Santascoy and to pay $75,000 in back wages to her employees whose hours were cut. Despite this recent victory, there is still work to be done as the two parties haven’t yet negotiated a contract. The ballot drive to ban fracking in Michigan has been put on ice for the time being while organizers gather funds to make a renewed effort in 2015. They’re not collecting signatures at the moment, but they do have some suggestions for how supporters can help in 2014. These include: giving donations, attending fundraisers and educational events, endorsing the campaign and volunteering. The drive collected 70,000 signatures between April and October of last year. More info can be found at letsbanfracking.org.